A fireplace surround refers to the decorative material placed around the outside of the fireplace opening, often including the mantel and the side coverings. The mantel can simply refer to the shelf area above the fireplace opening. Often the terms “mantel” and “surround” are used interchangeably. If you are looking for the right surround for your home or office, there are some factors to consider before making your final selection. Some of the most common features of a fireplace surround include color, texture, design style, and the material used to create the surround. Your choice on these specific factors may depend on the location where your fireplace is situated, how often you change your decor, and your personal taste preferences. If your fireplace surround will become the focal point of the room, you may wish to choose one with more intricate details and a splash of color, such as maroon or blue. If you change your surroundings a lot, you might want to go for more neutral features that will blend well with a wide range of decor options. Cast stone surrounds gives the appearance of real stone without the high-end price tag and are made with environmentally friendly renewable resources. 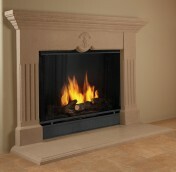 At SoCal Fireplace Mantels, we offer the option of custom fireplace surrounds in Orange County. If you are unable to find just the right surround to fit your taste, you can speak with one of our talented design experts to create the perfect surround for you.